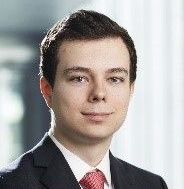 Alexander Adas is a Master of Finance Class of 2020 student. My name is Alexander Adas and I will be joining the Master of Finance at Frankfurt School this August. I finished my Bachelor in economics and mechanical engineering at TU Darmstadt last September. In the meantime, I am doing various internships in order to pinpoint in which sectors and functions I would like to work. The main reason I applied to FS is the combination of a profound academic education in this two-year program with the possibility to gain real-world experience through various opportunities. The Master of Finance offers a highly interesting curriculum with a lot of opportunities to specialize on whatever interest you the most. In addition, the learning environment with a focus on group work and case studies enables you to directly apply your knowledge on real problems. The three-day model allows you to work part-time and gain professional experience. Through career fairs and other corporate events you can get a lot of valuable insights into different sectors, companies and functions. Being located in Frankfurt, one of the world’s greatest financial hubs, you can get lots of exposure to the variety of the financial sector and live in a diverse and international city. Although it sounds like a cliché, I think it is true for FS – be yourself! The admission process is not based on a single factor. You are not judged only by your GMAT score, your grades or your work experience. FS looks for a diverse intake with people who have different backgrounds and skillsets. What are your strongest skills? What makes you different from the other applicants? Maybe think back to past work experience or group tasks. How did you contribute with your skills? Try to highlight these aspects. And be aware of your weaknesses. Think about how you want to improve yourself and how FS can help you. What concentration would I like to take? I am going to choose the corporate finance concentration. During my gap year I realized early on that I have a strong interest for the complex challenges you face in M&A projects. I am especially looking forward to the valuation course and the case study in investment banking. It is hard to decide what I am most looking forward to. As someone who wants to learn a lot of new things and apply his knowledge as soon as possible to real life problems, there are many opportunities to choose from at FS. Maybe I’ll enjoy the various group works and external competitions the most. Maybe I’ll develop a special interest for one course and will be able to dig deeper academically. Or maybe it will be career and networking events, where I can find out what my future dream job would look like. Besides that, I am looking forward to the life on campus. After meeting some fellow students at the assessment center and English tests, I am glad to be part of a diverse intake with lots of talented and motivated people. Spending two years in a group of like-minded people working towards a similar goal will definitely be a great experience.